We buy and sell antique icons. Please contact us for further informations. 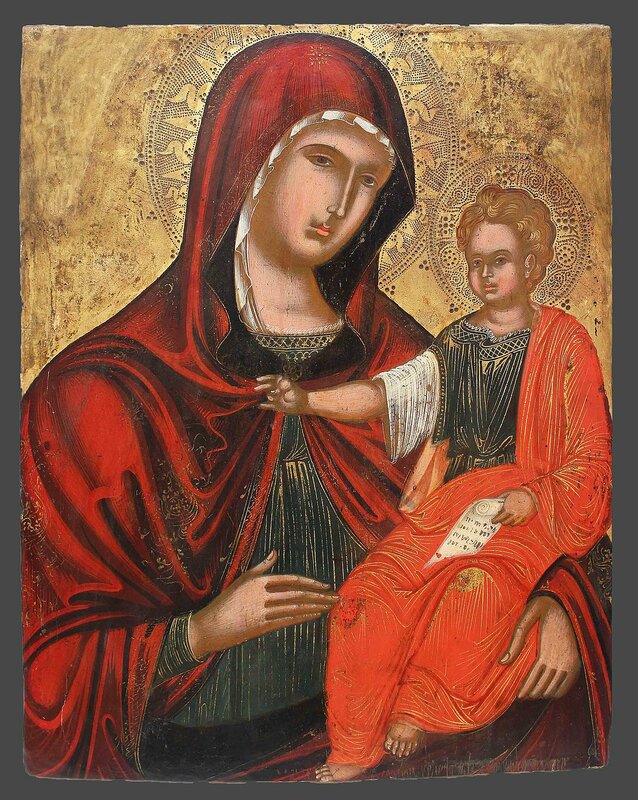 Since its foundation in 1974, the Icon Gallery Dritsoulas has established itself both nationally and internationally as one of the leading galleries for icon dealing. In 2007, the founder Serafim Dritsoulas passed his gallery on to the second generation, namely his sons Nicolas and Andreas. 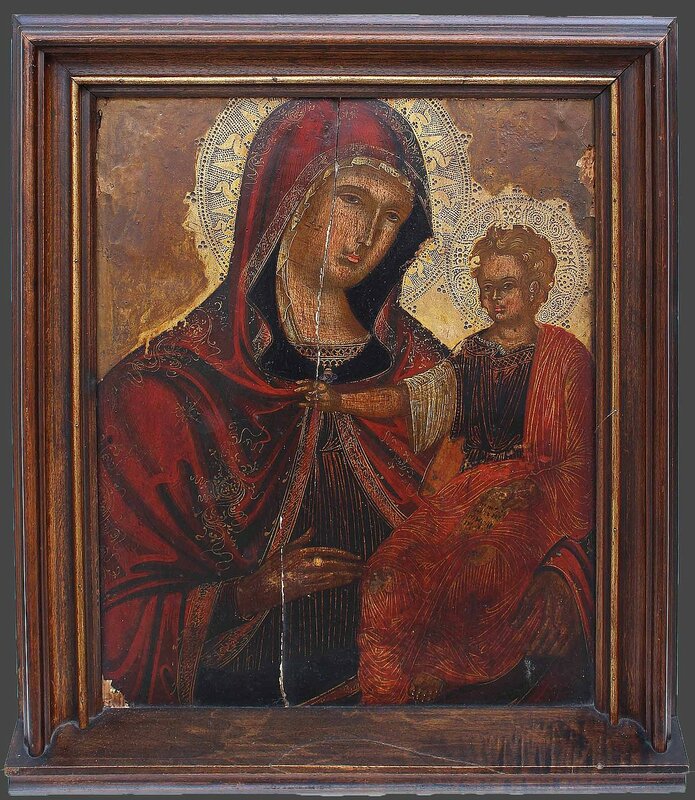 Our gallery displays an exceptional and varied collection of Russian and Greek icons dating back to the 15th – 19th century. These gems have made Dritsoulas a household name with national and international icon collectors and museums. We are headquartered at 9 & 11 Theresienstraße in Munich’s museum district, close to the three Pinakothek galleries and the newly erected Brandhorst Museum, which opened in 2009. From 1986 – 1993 we also maintained a branch in Cologne (16 Burgmauer) and from 1983 – 2005 we maintained a branch in Kevelaer (11 Kapellenplatz). 40 years of successfully running our gallery and the wide circle of regular customers comprised of national and international collectors and museums prove that we are a reliable and sustainable partner for icon dealing. An initial consultation and initial review of your icons is, of course, free of charge and non-binding. We can offer consultations in German, Greek, French and English. Simply send us a picture via the contact form provided, and we will get back to you as soon as possible. 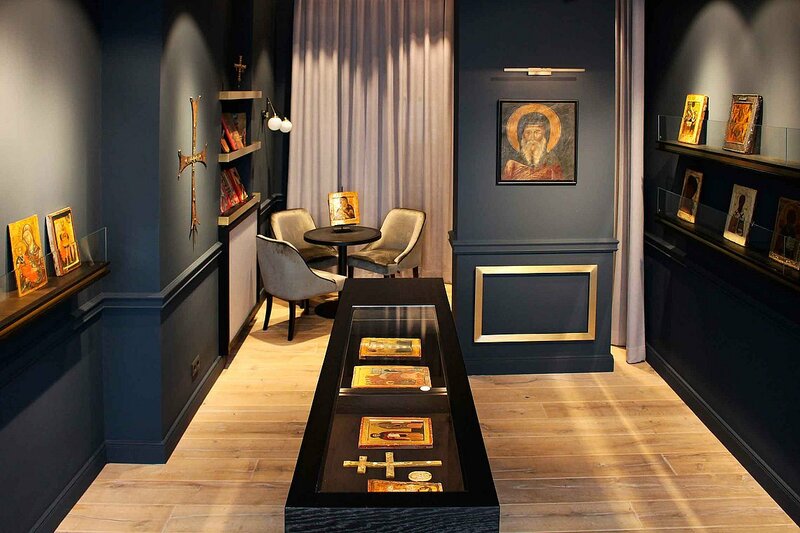 You are also welcome to contact us via telephone or email to arrange an appointment or pay us a visit at our newly refurbished gallery in Munich and delve into the fascinating world of icons. 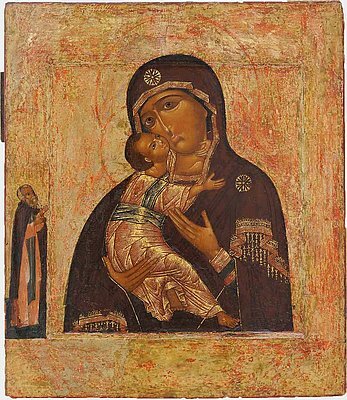 The term icon goes back to the Greek word “EIKON”, which can be translated as “Picture or likeness of an archetype”. 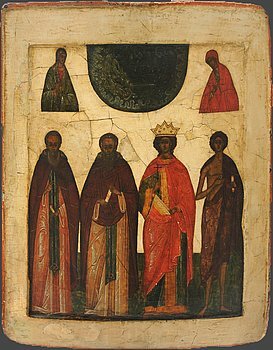 Icons are pictures typically found in Orthodox Churches, especially in Orthodox Churches of the Byzantine Rite. On the one hand, icons are works of art with a certain mystical aura. On the other hand, they are objects related to prayer and day-to-day life for believers. Every icon stands for the presence of God and is the most direct form of divine self-experience for an Orthodox believer. Frequent subjects are Christ, the Virgin Mother and saints. Often, scenes from the Old and New Testament or from Church history are depicted. Icons can be made of various materials such as wood, ivory, stone, bronze, brass, silver, gold enamel or woven fabric. The most common form is the wooden icon, which has traditionally been made in a fixed set of highly elaborate steps. Icons created today still follow the same procedures. Due to the number of individual steps and the necessary patience and skill of the artist, every carefully produced icon is a work of many months. To this day, Orthodox iconographers traditionally use egg tempera, i.e. colour pigments bound with egg. These colours have the advantage of not undergoing a chemical change, ensuring a painting can last many centuries. 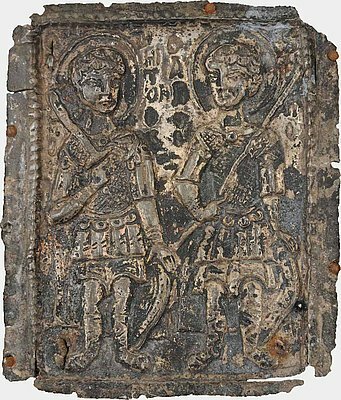 In addition to their use in church, where some monumental icons may be more than a metre high, many icons were designed for worship in the “good corner” of the house. House icons generally had a smaller format with a maximum height of 50 cm. Foldable icons (diptychs or triptychs) or metal icons frequently accompanied people when travelling. At Icon Gallery Dritsoulas, you can admire a huge selection of icons covering all ages, themes, materials and formats. We are looking forward to welcoming you at our gallery. If you decide to buy an icon or to start a collection, you should enjoy and have a love for this type of art. Living with icons is an ongoing process. An icon is a work of art that enhances any room and has a certain material value. Deciding to buy an icon is a form of long-term investment. However, the thought of making an investment should be secondary. When buying an icon, it is especially important to act with joy, taste and passion, but also with a sense of strategy and expertise. Thanks to our many years of experience, your icon purchase will be an artistically valuable, long-term and financially sensible investment that is sure to give you great pleasure every day. In order to learn to understand and love icons, you need time and patience. You will really need to study and expose yourself to this special form of art to truly get involved with it. Especially the western observer, who rarely comes into contact with icons, has to train his eye to fully appreciate these works of art. You can achieve this by viewing as many icons as possible. The most agreeable way to experience icons is to look at them in the churches and abbeys of Greece or Russia. This way, you will gradually develop a feeling for this form of art, and you will notice the striking differences between the icons, which – for the untrained eye – initially all seem to look the same. In order to better understand the background, history and iconography of individual works, it may be useful to immerse yourself into the literature on icons. We are always happy to help as a competent point of contact. The most important and decisive buying criterion is the subjektive impact of the icon to you. Beside this principal criterion there are some objektive factors that should be noted. Where there is art, there are forgeries. Just like with any other form of art, this is sadly also true of icons. For an amateur, it is extremely difficult to distinguish a forgery from an original. As reliable experts with extensive knowledge of the market, we are able to protect you from making a mispurchase. We promise quality, and you may expect quality. Only years of experience will train your eye to spot the differences in quality between individual icons. As experts in this field, we have the well-trained eye, the art history expertise and the necessary knowledge of the market to help you purchase a top quality icon at a fair price. The rarity of an icon increases its value. An icon may be classed as rare due to e.g. its age, the subject of the painting, its characteristics, its historical background and its provenance. The provenance, that is to say the documentation of the origins and the past of a work of art, can have a positive impact on its value. It describes the fate of a work since its creation and sheds light on its (art-) historical importance. The provenance can take various aspects into account: e.g. historical events, reports by renowned experts, famous previous owners, presentations at important exhibitions or at major museums and mentions in publications. However, an icon without provenance is not necessarily less valuable. It is sadly not unheard of that works of art with the best provenance turn out to be forgeries. In order to guarantee that our icons are not in any way dubious, they are examined by Art Loss. The more is preserved of the original painting, the greater the value of the icon. In order to maintain and protect the original parts, it is often necessary to clean and preserve them. Getting your icon restored might be a good idea, as long as it is done by a professional. As reliable icon dealers, we naturally indicate where restorations have been undertaken in the icons we sell. Customer satisfaction is our top priority. That is why, since 1974, the Icon Gallery Dritsoulas has been so successful on the icon market, a niche on the international art market. We convince our customers with an exceptional degree of service, security and personal consultation. Our best argument is, of course, our huge choice of unique icons. We exclusively deal with old originals (15th – 20th century). For every icon, we compile a comprehensive expert’s report describing the object in detail, certifying its genuineness, documenting any restorations and, of course, we provide the certificates and documents of provenance. We are aware of our huge responsibility towards our customers and the works of art and take them very seriously in order to provide the highest level of security. 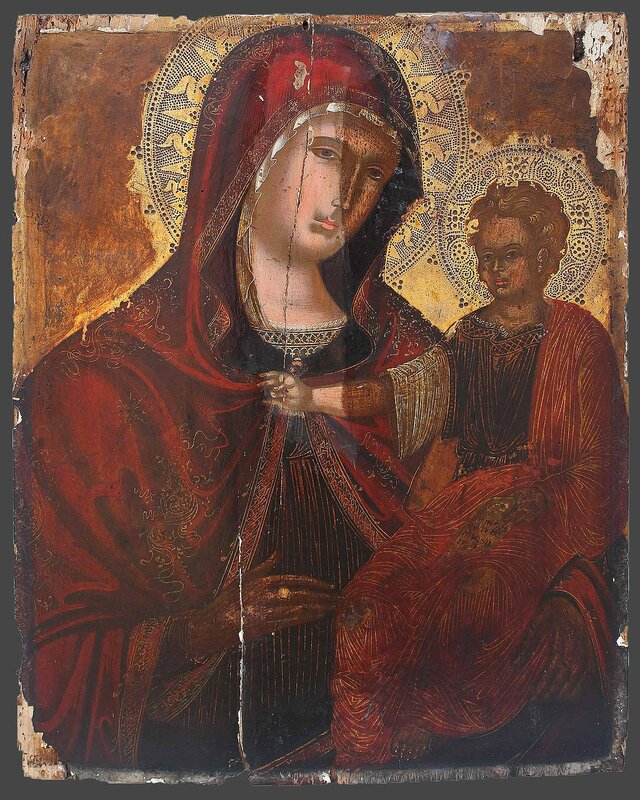 The impeccable provenance of our icons is verified by checking them against the Art Loss register. Without exception, all applicable import and export regulations are observed. Excellent service is a matter close to our hearts. Should you be unable to decide which icon to buy, we offer a test-hanging service: we will bring along your shortlist of works and you can experience their effect in your home. This way, you are sure to find the perfect icon. Once you have made your decision, we would be happy to organise the shipment and provide any necessary export papers. If you want to enhance or change your collection, we would be happy to help and will gladly offer advice on how to proceed – we may, for example, swap one of your icons for another one. Should your icon have suffered damage such as cracks, blistering, chips due to a fall, wrong storage conditions, water damage or other influences, we would be happy to take care of the necessary restoration and preservation. Should you have any other queries or wishes, please do not hesitate to contact us. We are always glad when we can be of service. We would love to explain our services in detail during a personal consultation appointment. We also offer consultation in case of an inheritance, dissolution of collections or when determining insurance values.